WOLVERINE #68 (1993) MARVEL COMICS AMAZING MARK TEXEIRA ART! LARRY HAMA! 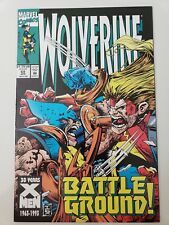 Wolverine #68 (Apr 1993, Marvel) Battle Ground! Wolverine#68 Incredible Condition 9.4(1993)Texeira Art!! Wolverine #75 - CGC 9.8 NM/MT - Marvel 1993 - Hologram Cover! 1st Bone Claws! WOLVERINE VOLUME II #65 NICK FURY * THE X-MEN MARVEL 1993 NICE!!! This page was last updated: 18-Apr 10:46. Number of bids and bid amounts may be slightly out of date. See each listing for international shipping options and costs.